Elizabeth Volpé Bligh became the Vancouver Symphony’s Principal Harpist in 1982, after six seasons as the Principal Harpist of the National Ballet of Canada Orchestra. A graduate of University of Toronto’s Bachelor of Music program in 1975, she studied with Judy Loman (Toronto Symphony), Alice Chalifoux (Cleveland Orchestra) and Edna Phillips (Philadelphia Orchestra). Ms. Volpé’s career includes concerto performances with the VSO and other orchestras, chamber music concerts, movie soundtracks and recordings. She is featured in The Greater Vancouver Album, a collection of works by Michael Conway Baker, and performed the Harp Concerto that he wrote for her with the VSO. It was recorded by CBC and can be listened to on Michael Conway Baker’s web site. She premiered a commissioned piece by Scott Good, Sonata for harp and strings at the World Harp Congress in Sydney, Australia in 2014, and repeated the performance with the VSO. Many of Elizabeth’s students have won awards such as the Vancouver Youth Symphony Orchestra Concerto Competition, Edith Lando Gifted Youth Scholarship, and RCM Medals, and four students have been members of the National Youth Orchestra of Canada. She has enjoyed watching her students become successful professional harpists and harp teachers. Her teaching career has included teaching privately and at institutions such as the VSO School of Music, UBC, VSOIW, PRISMA, Vancouver Academy of Music, Vancouver Community College, Douglas College, Pacific Harp Institute, and the Island Mountain Arts Festival. She has had students from all over the world come to study with her including from Hong Kong, Singapore, Ireland, Germany and France. She taught and performed at the 6th International Harp Workshop in Sanctuaria del Crea in Italy. 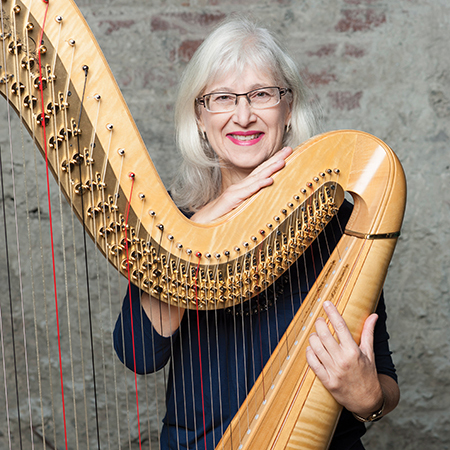 Ms. Volpé has had articles published in Harp Column, Teachers’ Forum of the American Harp Journal, Dutch Harp Journal, the New Zealand Harp Association newsletter, and online. She has given master classes in China, Italy, New Zealand, the USA and across Canada. Her compositions for solo harp, several of which are included in the 2008 Royal Conservatory of Music and Trinity UK Syllabuses, are being taught and performed all over the world. They are now being published by Canadian Music Centre and will be available on Harp Column Music. Elizabeth is currently President of the West Coast Harp Society/ BC Chapter of the American Harp Society and was the Chair of the 11th World Harp Congress Host Committee. She has been featured as a performer, panellist and lecturer at World Harp Congresses and American Harp Society Conferences, and was a judge at the OSM Standard Life Competition in 2010.